In the final part of this project series, we’ll layout the 3D printed parts to make the Destiny Ghost skin. 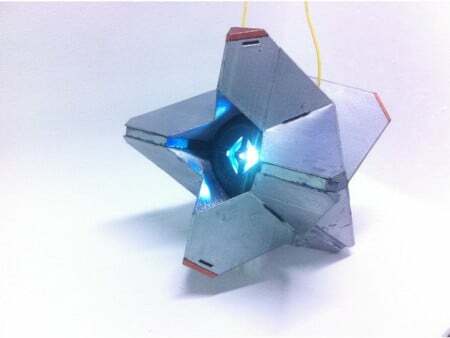 In the final installment of this joint project series with All About Circuits, we'll layout the 3-D printed parts needed to make the alternative "Destiny" Ghost skin! See the table of contents below if you'd like to catch up on the project. 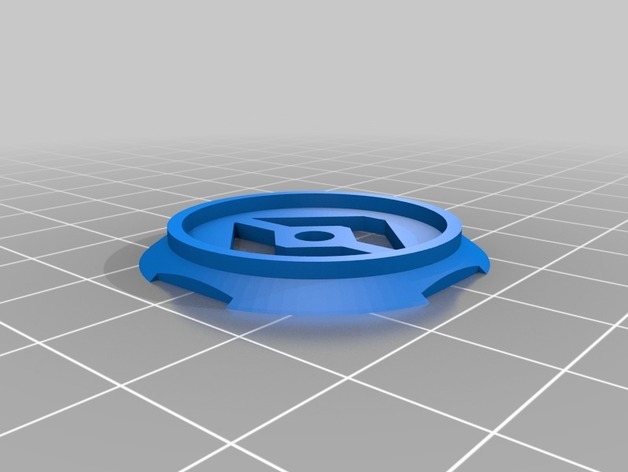 The files for the "Destiny" Ghost skin are on Thingverse, and instructions are below! This holds all the electronic components. Glue the Neopixel in place so it faces forward (it should fit into the square cut-out) and use zip-ties to secure the ESP-12, voltage regulator module, and servo to their posts. Try to keep the wires short enough so they're stored behind the servo. If they protrude into the back half, they could get caught on something. This is the front of the eyeball. It has four registration wedges on the inside to align the Iris, Baffle, and Carrier. 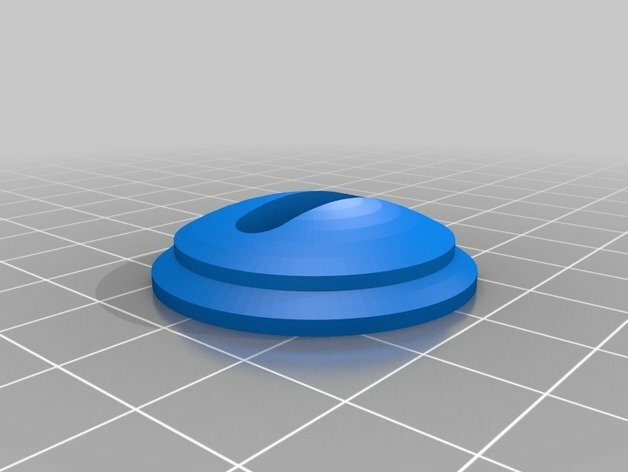 Its raised "nubs" on the outside help retain the shell, and it's designed to print without supports. This is a separate piece to fit inside the front half of the eyeball. This should be painted black on the topside, but white or silver on the underside to help reflect light within the baffle. This is outwardly identical to the front half, but it's missing the registration wedges on the inside. 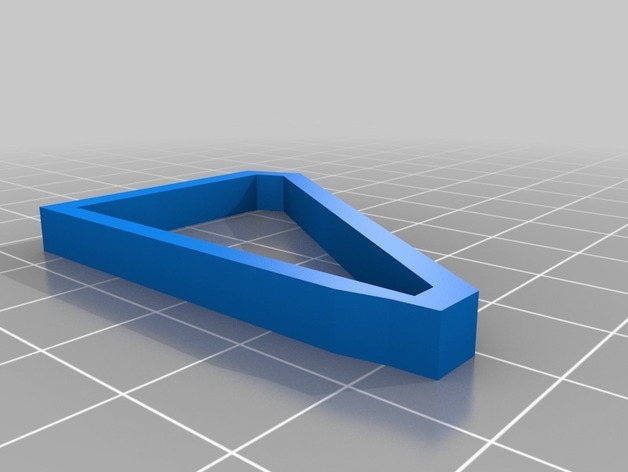 Print without supports. 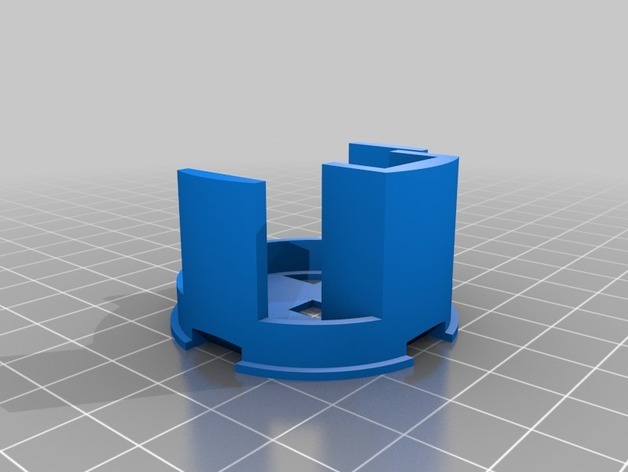 This accepts the servo spline and plugs up the hole in the back half. 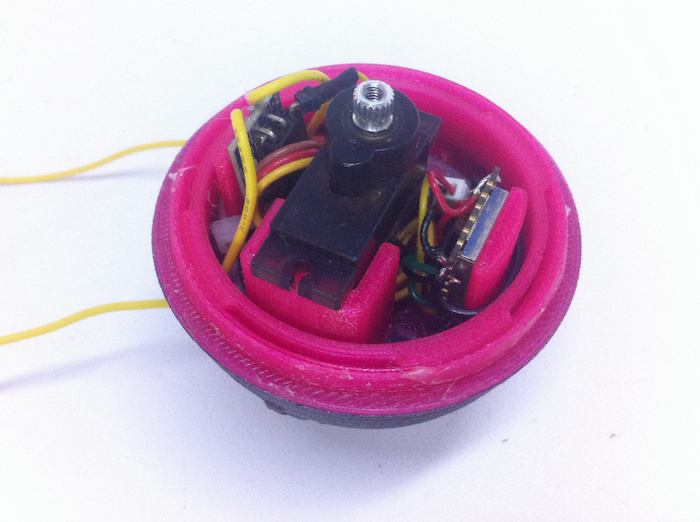 It's designed to press-fit tight enough so the servo can spin the whole back half, but it can still be removed. If it's too loose, some glue might be necessary. This press-fits (or is hot-glued) into the rim of the back half, and it provides an inner profile for the clip to engage. It helps to have a shiny build surface, as the underside of this part will slide against the opposing rim of the front half. This clips the front half of the eye to the bearing ring and basically holds the two halves together so they can still rotate. It should be quite difficult to remove (and therefore to install), so you might need to tweak the XY scaling slightly to get good tolerances. The baffle and iris just stack on the front of the carrier, and the lot should just drop into the front half of the eyeball, where they will register against the little wedges. You might add a dab of hot glue toward the end, especially if the carrier is loose enough to "rattle" when the servo applies some force, but you shouldn't need it at first. On my printer, the iris has perfect tolerance to just snap into the hole and stay there. Assembling the "bearing ring" is the trickiest part. The clip is painful to get on. In an ideal world, you'd just press the front half and the bearing ring together with the clip between them until it all snaps into place. In practice, you'll have to be careful so the parts don't break in the process. I print with PETG filament, which is a fairly flexible material when abused. 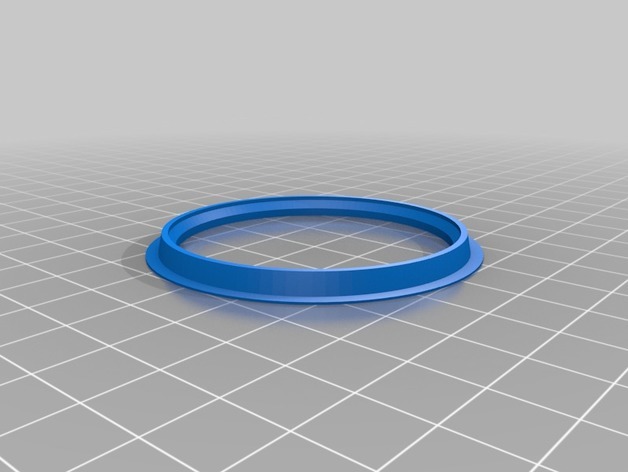 I'm hoping that PLA and ABS aren't so brittle that the ring snaps. The clip can't be too loose (and therefore easy to install). Otherwise, the front will fall off in use, and all the contents of the ball will spill out. I originally thought the clip was going to directly hold the front and back halves together, but the difficult assembly (and then disassembly) convinced me to make the bearing ring separate from the back half. If both the ring and plug are good press-fits, then the back half can be put on and taken off (giving access to the electronics) with relative ease during the "still working on it" stage, but you can seal it up with some dabs of hot glue at the end—so a good yank will still open it again. There's also an advantage having the plug (which is on the servo spline) friction-fit into the back half. That forms a "clutch", so, if you take a really hard knock (but the plug can spin somewhat), then you won't necessarily wreck up the servo—just so long as there's enough friction to transmit the normal servo torque. 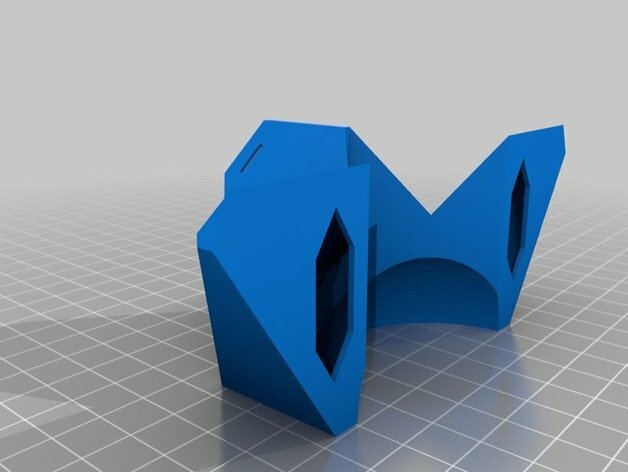 These are hollow shells have their geometry tuned so that the majority of the surface prints with exactly two perimeters when using a 0.4mm nozzle. Some structurally important areas get more material. They're "bird-boned". 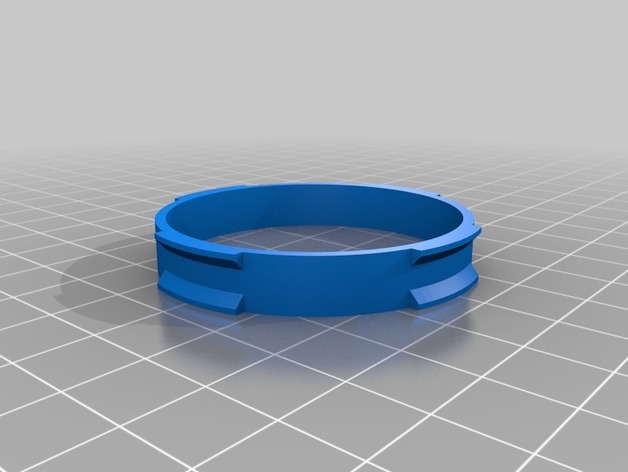 That keeps weight to the absolute minimum, but it also makes for a challenging print. Perhaps make five and use the best four? Two of these are used to glue the shell halves together. 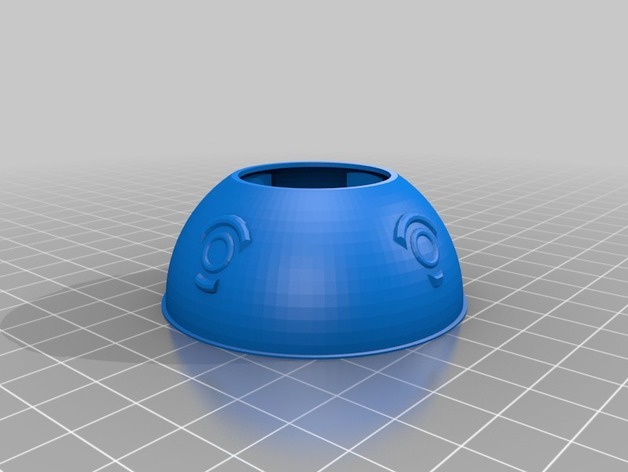 They can be printed in a different material for texture, and they are easy to adjust (z-scale) at the last minutei—if the eyeball doesn't clip in as nicely as it should. Once you have pairs of half-shells, you can glue them together with the joints in between. You might want to keep the nicest-looking prints for the front half. If all your tolerances are good, the shells will just press-fit onto the ball, and the little surface "nubs" will lock them in place. If you're really into "Destiny," you might consider printing out a couple of shells and doing variations for "Iron Age" or "Frontier"—or your own custom Ghost. You still need to get power into the ball somehow. I made small holes through the outer shell and ball at the top. Then, I ran thin, flexible silicon wire into the core so I could "hang" the Ghost from the ceiling, which I hoped would look like it was floating. You could also use a desk stand with a mounting stick that comes up from below. 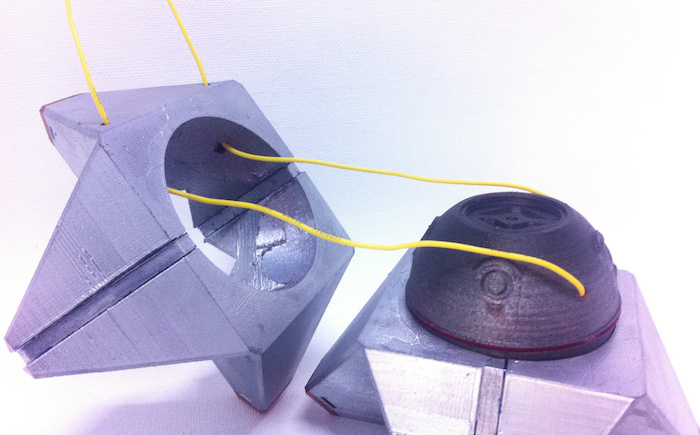 Or, you could try to squeeze a battery inside the shell and make it fully self-contained.